For me, sewing is much more than just a means to a new item of clothing. Part of my hobby is being inspired, going through my stash, shopping for interesting fabrics and falling in love with new patterns. Part of my hobby is practicing new techniques and using my hands to create an object out of its parts. I find that whole process incredibly enjoyable and have no desires to restrict it. So my version of “planning” is rather loose! 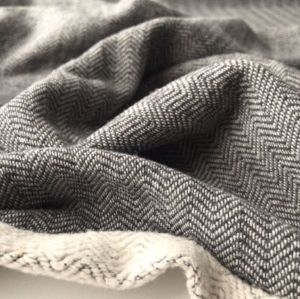 We have some really amazing fabrics for fall and I am most excited about this french terry that features a herringbone pattern. This knit is thick and looks woolly, but is actually 100% organic cotton - no scratchy necks here! I think a creamy soft sweater is a winter classic and any basic pattern would be a good match for this fabric - Ready to Sew Jeanne, Grainline Linden Sweatshirt and Style Arc Como Knit Cardi all come to mind. But while researching good recommendations for this fabric, I found Blueprints for Sewing’s Geodesic Sweater and was intrigued. I reckon the pattern will really take advantage of the directionality of the herringbone weave and my hope is the fabric/pattern matchup will give me a subtly quirky sweater I can snuggle in all season. I am very excited about this project! It’s true I do have some holes in my wardrobe when it comes to me-made items. At work, I have been slouching around in a free hoodie my friend sent me that advertises Purina Pro Plan for when the air conditioning is too high (always!). An ambitious plan would be to create several beautiful blazers and jackets I could wear on rotation. However, I recognize that in general I just want a warm thing at work I can put on over whatever I am wearing that day, rather than making another decision when getting dressed in the morning. Classic cardigans feel too stuffy for me and I don’t find waterfall cardigans to be particularly flattering (on me!) so I focused my search on something with a little more structure. I purchased the Merchant & Mills workbook on my last visit to Craft South in Nashville. That was two whole years ago and yet I have only made the Bantam vest! The Haremere jacket is one of the more complicated patterns included and fits the bill. I love the oversized fit and think will be better for my first foray into jacket tailoring. It is also only partially lined and has a drop shoulder, two more pluses for the pattern in terms of difficulty. And I’m looking forward to following sewing instructions out of a book instead of a pdf! I usually pull up the instructions on my laptop to follow instead of printing them out with the pattern pieces. Truthfully, there are a few things that drive me crazy about this but none of them can really justify doing it another way, so I’m excited to be able to follow instructions by my preferred method. It’s the little things! I can’t remember exactly where I read/listened/saw this, but I am going to try very very hard to get out my basket of UFOs (UnFinished Objects) before I start something new. Then I want to commit to spending a good 20 minutes on making progress on whatever needs to be completed. Recently I was reorganizing my sewing room and found a dress that only needed its hem done. It had completely slipped my mind! It was a quick wearable muslin of the Seamwork Kimmy done up in a basic black cotton with a little stretch, and, clearly, sort of forgettable. Flitting off to the next exciting project is a definite pitfall in my loose style of “planning” so I’m expecting that a review of my UFO bin will slow me down and nudge me to complete projects (or encourage me to pinpoint why I’m not interested in finishing it). Do you have any tips for planning? What are your ideas for this fall?